How a Mosquito Operates is a 1912 silent animated film by American cartoonist Winsor McCay. 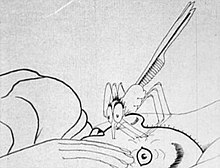 The six-minute short depicts a giant mosquito tormenting a sleeping man. The film is one of the earliest works of animation, and its technical quality is considered far ahead of its contemporaries. It is also known under the titles The Story of a Mosquito and Winsor McCay and his Jersey Skeeters. McCay had a reputation for his proficient drawing skills, best remembered in the elaborate cartooning of the children's comic strip Little Nemo in Slumberland he began in 1905. He delved into the emerging art of animation with the film Little Nemo (1911), and followed its success by adapting an episode of his comic strip Dream of the Rarebit Fiend into How a Mosquito Operates. McCay gave the film a more coherent story and more developed characterization than in the Nemo film, with naturalistic timing, motion, and weight in the animation. How a Mosquito Operates had an enthusiastic reception when McCay first showed it as part of his vaudeville act. He further developed the character animation he introduced in Mosquito with his best-known animated work, Gertie the Dinosaur (1914). A man looks around apprehensively before entering his room. A giant mosquito[a] with a top hat and briefcase flies in after him through a transom. It repeatedly feeds on the sleeping man, who tries in vain to shoo it away. The mosquito eventually drinks itself so full that it explodes. How a Mosquito Operates is one of the earliest examples of line-drawn animation. McCay used minimal backgrounds and capitalized on strengths of the film medium, then in its infancy, by focusing on the physical, visual action of the characters. No intertitles interrupt the silent visuals. Rather than merely expanding like a balloon, as the mosquito drinks its abdomen fills consistent with its bodily structure in a naturalistic way. The heavier it becomes, the more difficulty it has keeping its balance. In its excitement as it feeds, it does push-ups on the man's nose and flips its hat in the air. The mosquito has a personality: egotistical, persistent, and calculating (as when it whets its proboscis on a stone wheel). It makes eye contact with the viewers and waves at them. McCay balances horror with humor, as when the mosquito finds itself so engorged with blood that it must lie down. Winsor McCay had built a reputation for his drawing skills in his newspaper comic strips before pioneering in animation. Winsor McCay (c. 1869–1934)[b] developed prodigiously accurate and detailed drawing skills early in life. As a young man, he earned a living drawing portraits and posters in dime museums, and attracted large crowds with his ability to draw quickly in public. McCay began working as a full-time newspaper illustrator in 1898, and started drawing comic strips in 1903. His greatest comic-strip success was the children's fantasy Little Nemo in Slumberland, which he launched in 1905. McCay began performing on the vaudeville circuit the following year, doing chalk talks—performances in which he drew in front of a live audience. Inspired by flip books his son Robert brought home, McCay said he "came to see the possibility of making moving pictures" of his cartoons. He declared himself "the first man in the world to make animated cartoons", though the American James Stuart Blackton and the French Émile Cohl were among those who had made earlier ones, and McCay had photographed his first animated short under Blackton's supervision. McCay featured his Little Nemo characters in the film, which debuted in movie theatres in 1911, and he soon incorporated it into his vaudeville act. The animated sequences in Little Nemo have no plot: much like the early experiments of Émile Cohl, McCay used his first film to demonstrate the medium's capabilities—with fanciful sequences demonstrating motion for its own sake. In Mosquito he wanted greater believability, and balanced outlandish action with naturalistic timing, motion, and weight. Since he had already demonstrated in his first film that pictures could be made to move, in the second he introduced a simple story. Vaudeville acts and humor magazines commonly joked about large New Jersey mosquitoes they called "Jersey skeeters", and McCay had used mosquitoes in his comic strips—including a Little Nemo episode[c] in which a swarm of mosquitoes attack Nemo after he returns from a trip to Mars. McCay took the idea for the film from a June 5, 1909, episode of his comic strip Dream of the Rarebit Fiend, in which a mosquito (without top hat or briefcase) gorges itself on an alcoholic until it becomes so bloated and drunk that it cannot fly away. McCay based the film on the June 5, 1909, episode of his Dream of the Rarebit Fiend comic strip. McCay began working on the film in May 1911. Shortly after, he left the employ of the New York Herald for the newspapers of William Randolph Hearst—a sign of his rising stardom. A magazine advertisement in July announced a "moving picture, containing six thousand sketches ... [that] will be a 'release' for vaudeville next season by Mr. McCay. The film will be named How a Mosquito Operates." McCay made the 6 000 drawings on translucent rice paper. The film came before the development of cel animation, in which animators draw on clear sheets of celluloid and lay them over static backgrounds. Thus, on each drawing McCay had to redraw the background, which appears to waver slightly due to the difficulty of reproducing it perfectly each time. McCay re-used some of the drawings to loop repeated actions, a technique he used once in Little Nemo and more extensively in his later films. McCay finished drawing the film in December 1911. A snowstorm hit when he was to have the drawings taken to Vitagraph Studios for photographing, so he hired an enclosed horse-drawn taxi to have them taken there. It disappeared, and a few days later the police found the abandoned taxi with the drawings unharmed inside, the horses two to three miles away. The first attempt to shoot the artwork resulted in unacceptable amounts of flicker due the arc lighting the studio used, and it was re-shot. The completed work came to 600 feet of film. How a Mosquito Operates debuted in January 1912 as part of McCay's vaudeville act, which he toured through that spring and summer. Film producer Carl Laemmle bought the distribution rights under the restriction that he not have the film shown in the US until McCay had finished using it in his vaudeville act. Universal–Jewel released the film in 1916 under the title Winsor McCay and his Jersey Skeeters, and it has sometimes been called The Story of a Mosquito. In a lost live-action prologue, McCay and his daughter, "pestered to death by mosquitoes" at their summer home in New Jersey, find a professor who speaks the insects' language. The professor tells McCay to "make a series of drawings to illustrate just how the insect does its deadly work", and after months of work McCay invites the professor to watch the film. How a Mosquito Operates was released at a time when audience demand for animation outstripped the studios' ability to supply it. According to animator Chris Webster, at a time when most studios struggled to make animation merely work, McCay showed a mastery of the medium and a sense of how to create believable motion. John Randolph Bray's The Artist's Dream (1913) bore thematic resemblance to McCay's first two films, but Bray denied McCay's influence. I drew a great ridiculous mosquito, pursuing a sleeping man, peeking through a keyhole and pouncing on him over the transom. My audiences were pleased, but declared the mosquito was operated by wires to get the effect before the cameras. To show that he had not used such tricks, McCay chose a creature for his next film that could not have been photographed: a Brontosaurus. The film, Gertie the Dinosaur, debuted as part of his vaudeville act in 1914. Before he brought out Gertie, he hinted at the film's subject in interviews in which he spoke of animation's potential for "serious and educational work". American animator John Randolph Bray's first film, The Artist's Dream, appeared in 1913; it alternates live-action and animated sequences, and features a dog that explodes after eating too many sausages. Though these aspects recall McCay's first two films, Bray said that he did not know of McCay's efforts while working on The Artist's Dream. Following Mosquito, animated films tended to be story-based; for decades they rarely drew attention to the technology underlying it, and live-action sequences became infrequent. Animator and McCay biographer John Canemaker commended McCay for his ability to imbue a mosquito with character and personality, and stated the technical quality of McCay's animation was far ahead of its time, unmatched until the Disney studios gained prominence in the 1930s with films such as Snow White and the Seven Dwarfs (1937). ^ In an overview of McCay's works in 1975, John Canemaker refers to the mosquito by the name Steve. Wikimedia Commons has a file available for this episode from October 23, 1910. ^ a b Canemaker 2005, p. 165. ^ Canemaker 1975, p. 45; Hoffer 1976, p. 31. ^ Canemaker 2005, p. 165; Berenbaum 2009, p. 138; Telotte 2010, p. 54; Dowd & Hignite 2006, pp. 13–14. ^ Berenbaum 2009, p. 138. ^ a b c Rayner & Harper 2014, p. 184. ^ Petersen 2010, p. 111. ^ a b Pike 2012, p. 30. ^ Barrier 2003, p. 17; Dowd & Hignite 2006, p. 13. ^ a b c d Canemaker 2005, p. 167. ^ a b c Dixon 2011, p. 101. ^ Canemaker 2005, pp. 23–24. ^ Canemaker 2005, pp. 38, 40, 43–44. ^ Canemaker 2005, p. 47. ^ Canemaker 2005, p. 60. ^ Canemaker 2005, p. 97. ^ Canemaker 2005, pp. 131–132. ^ Beckerman 2003; Canemaker 2005, p. 157. ^ a b c Canemaker 2005, p. 157. ^ Canemaker 2005, p. 160. ^ a b Wood 2012, pp. 23–24. ^ a b c d Canemaker 2005, p. 164. ^ Eagan 2010, p. 33; Canemaker 2005, p. 167. ^ Hoffer 1976, p. 31. ^ Smith 1977, p. 24. ^ Theisen 1967, p. 84; Canemaker 2005, p. 164. ^ a b Furniss 2009, p. 99. ^ a b Bendazzi 1994, p. 16. ^ Barrier 2003, p. 10. ^ Crafton 2014, p. 332. ^ a b Eagan 2010, p. 33. ^ Canemaker 2005, pp. 164–165. ^ Webster 2012, p. 11. ^ a b c d Canemaker 2005, pp. 167–168. ^ a b Mosley 1985, p. 62. ^ Murray & Heumann 2011, p. 92. ^ Furniss 2009, p. 99; McCay 2005, p. 14. ^ Crafton 1993, p. 110. ^ Barrier 2003, p. 12. ^ Wood 2012, p. 24. ^ Webster 2012, p. 11; Canemaker 2005, p. 167. Beckerman, Howard (2003). Animation: The Whole Story. Skyhorse Publishing. ISBN 978-1-58115-301-9. Bendazzi, Giannalberto (1994). Cartoons: One Hundred Years of Cinema Animation. Indiana University Press. ISBN 978-0-253-31168-9. Berenbaum, May R. (2009). The Earwig's Tail: A Modern Bestiary of Multi-Legged Legends. Harvard University Press. ISBN 978-0-674-03540-9. Canemaker, John (February 1975). "Winsor McCay". Film Comment (11): 44–47. Crafton, Donald (2014). Émile Cohl, Caricature, and Film. Princeton. Princeton University Press. ISBN 9781400860715 – via Project MUSE. (Subscription required (help)). Crafton, Donald (1993). Before Mickey: The Animated Film 1898–1928. University of Chicago Press. ISBN 978-0-226-11667-9. Dixon, Bryony (2011). 100 Silent Films. Palgrave Macmillan. ISBN 978-1-84457-569-5. Furniss, Maureen (2009). Animation: Art and Industry. John Libbey Publishing. ISBN 978-0-86196-904-3. Hoffer, Tom W. (Spring 1976). "From Comic Strips to Animation: Some Perspective on Winsor McCay". Journal of the University Film Association. 28 (2): 23–32. JSTOR 20687319. Hubbard, Amy (2012-10-15). "Celebrating Little Nemo by Winsor McCay; his 'demons' made him do it". Los Angeles Times. Archived from the original on 2013-02-13. Retrieved 2012-12-15. McCay, Winsor (2005) . "From Sketchbook to Animation". In Marschall, Richard. Daydreams and Nightmares: The Fantastic Visions of Winsor McCay (2 ed.). Fantagraphics Books. pp. 13–18. ISBN 978-1-56097-569-4. Mosley, Leonard (1985). Disney's World: A Biography. Rowman & Littlefield. ISBN 978-0-8128-3073-6. Murray, Robin L.; Heumann, Joseph K. (2011). That's All Folks? : Ecocritical Readings of American Animated Features. University of Nebraska Press. ISBN 978-0-8032-3512-0. Pike, Deidre M. (2012). Enviro-Toons: Green Themes in Animated Cinema and Television. McFarland. ISBN 978-0-7864-9002-8. Rayner, Jonathan; Harper, Graham (2014). Film Landscapes: Cinema, Environment and Visual Culture. Cambridge Scholars Publishing. ISBN 978-1-4438-6631-6. Smith, Conrad (Summer 1977). "The Early History of Animation: Saturday Morning TV Discovers 1915". Journal of the University Film Association. 29 (3): 23–30. JSTOR 20687377. Telotte, J. P. (2010). Animating Space: From Mickey to Wall-E. University Press of Kentucky. ISBN 978-0-8131-2586-2. Theisen, Earl (1967) . "The History of the Animated Cartoon". In Fielding, Raymond. A Technological History of Motion Pictures and Television. University of California Press. pp. 84–87. OCLC 534835. Webster, Chris (2012). Action Analysis for Animators. Focal Press. ISBN 978-0-240-81218-2. Wood, Aylish (2012). Digital Encounters. Routledge. ISBN 978-1-136-79009-6.